An earthquake measuring 6.0 Mw struck in the South China Sea off the west coast of Mindoro, Philippines, at a depth of 50.1 km on September 18, 2009 at 06:23:58 UTC, USGS/ EHP said. The Philippine Institute of Volcanology and Seismology (Phivolcs) reported the quake as a magnitude 6.1 shock on the Richter scale. Phivolcs said the quake was felt at various intensities in Mamburao and Batangas City; Makati City, Pasay City, Manila City, Tagaytay City and Dasmariñas City; in San Jose town (in Occidental Mindoro), Puerto Galera, Malay (in Aklan), and Guinayangan (in Quezon). Phivolcs also said it was expecting aftershocks and some damage caused by the earthquake; however, as of posting, no damage had been reported. There was no report of tsunami after the quake. According to the latest National Disaster Coordinating Council (NDCC) report on Mayon’s activity issued on July 11, 2009, some 1,675 families or 6,996 persons will be evacuated from the 7-km Extended Danger Zone (EDZ), an area located on the SE flank of the volcano and the 6-km Permanent Danger Zone (PDZ) areas, if the Philippine Institute of Volcanology and Seismology (Phivolcs) raises the Alert Level for the area from 2 to 3 (on a scale of 0-5). Alert Level 3 is regarded as “significant local eruption,” on Phivolcs’ five-level alert system. On Sunday, Phivolcs research specialist Rudy Lacson reportedly told GMANews.TV that there were no signs of volcanic activity that would warrant raising Mayon’s alert level. “Three volcanic earthquakes were detected and a more ‘intense’ glow at the crater were observed within the past 24 hours, but Lacson said these signs were ‘normal’ for the volcano’s current status.” GMA said. “Lacson said Phivolcs was still closely monitoring Mayon’s volcanic activity and advised people in the area to stay away from the six-kilometer radius permanent danger zone. “Officials also advised 4,000 farmers who were keeping watch over crops within the permanent danger zone to return to their villages at night to avoid getting caught by surprise should the volcano erupt.” GMA said. Mayon volcano, which last erupted in 2008, is considered to be the most active volcano in the Philippines. 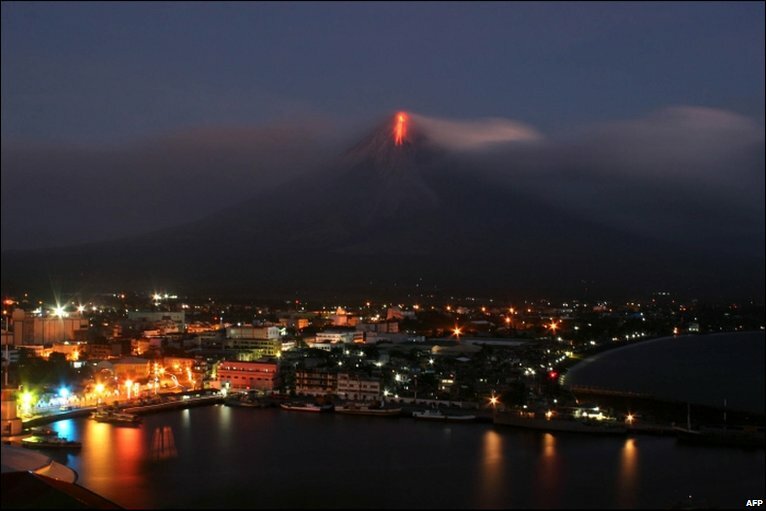 FEWW moderators believe that the Philippines should brace itself for major waves of seismic and volcanic activities in the coming weeks, months and years..
A nighttime view from Legaspi City on September 14, 1984, shows incandescent lava flows descending the SW flank of Mayon volcano in the Philippines. The flows traveled about 4 km to the lower flanks of the volcano, adjacent to previous flows from eruptions in 1968 and 1978. Photo by Norm Banks, 1984 (U.S. Geological Survey). Caption: GVP. Mayon volcano in the Philippines is one of Earth’s best examples of a classic, conical stratovolcano. Its symmetrical morphology is the exception rather than the rule, and is the result of eruptions that are restricted to a single central conduit at the summit of the volcano. Eruptions are frequent enough at Mayon, the most active volcano in the Philippines, to overcome erosive forces that quickly modify the slopes of most volcanoes. Photo by Chris Newhall, 1993 (U.S. Geological Survey). Caption: GVP. Ash clouds rise above a pyroclastic flow traveling down the Buang valley on the upper NW flank of Mayon volcano in the Philippines on September 12, 1984. The toe of the advancing pyroclastic flow is visible at the lower right. These pyroclastic flows traveled down to 100 m elevation at rates of about 20 m/sec. Photo by Olimpio Pena, 1984 (Philippine Institute of Volcanology and Seismology). Caption: GVP. July 20, 2006 photo shows a phreatic explosion [ultravulcanian eruption, also described as steam-blast eruption] occurring along the lower slopes as lava cascades down the 8,077-foot (2,462-meter) Mayon volcano in the central Bicol region in the Philippines. (AP Photo/Bullit Marquez, FILE). Image may be subject to copyright.